The following questions numbered 1, 2 and 3 are based on the velocity-time graph of a particle in one dimensional motion shown in the adjoining figure. The area under the velocity-time curve gives the displacement. 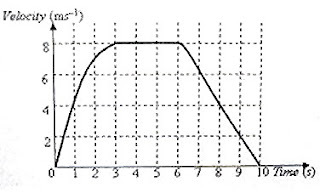 The portion of the graph for the interval from zero to 1 second is straight and the area under the curve is triangular and is equal to (½)×1×4 = 2 m.
The 3rd second is the interval from 2 seconds to 3 seconds and during this time the velocity increases from 7 ms–1 to 8 ms–1. The acceleration is therefore (8 – 7)/1 = 1 ms–2. The 7th second is the interval from 6 seconds to 7 seconds and during this time the velocity decreases from 8 ms–1 to 6 ms–1. 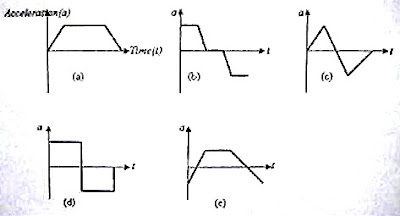 (3) Which one among the following acceleration–time graphs most closely represents the motion of the particle? The acceleration is positive and uniform initially. Afterwards the acceleration becomes zero (since the velocity remains constant) for some time and then becomes negative (since the velocity goes on decreasing) and uniform. The curve shown in (b) therefore represents the motion of the particle. We have v2 = u2 + 2as where u and v are the initial ans final velocities respectively, a is the acceleration and s is the displacement. Therefore, v1 = 8.2 ms–1 nearly. Questions on rotational motion have been discussed on many occasions on this site. You can access them by clicking on the label ‘rotation’ below this post. Now, see the following questions involving rotation. (1) A light inextensible string is wound round a wheel of moment of inertia I and radius R. A mass m is attached to its hanging end as shown. The wheel and the mass are initially at rest. Assume that there are no frictional forces opposing the motion. When the mass is released, it moves down and rotates the wheel. 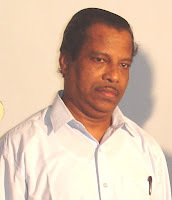 When the mass has fallen down through a distance h, what is the angular velocity of the wheel? mgh = ½ mv2 + ½ Iω2 where v is the velocity of the mass after falling through the distance h and ω is the angular velocity of the wheel. 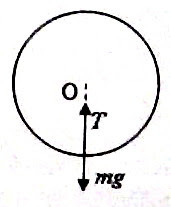 T – mg = mrω2, where m is the mass of the bob, T is the tension in the string, r is the radius of the circular path and ω is the angular velocity of revolution of the bob. We have substituted the maximum tension the string can withstand and hence the above angular velocity is the maximum value possible.